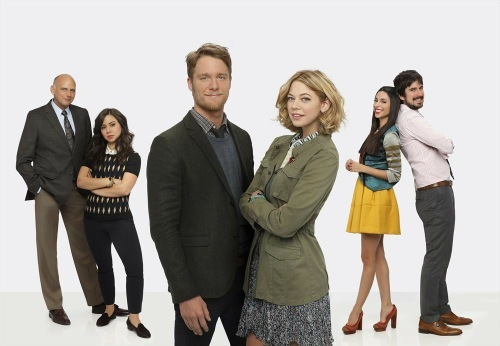 The new ABC comedy Manhattan Love Story is its version of NBC’s new A to Z. Or maybe vice-versa. In each coupling, boy meets girl, misunderstandings ensue and this will never work -- or maybe it will because these are network sitcoms. Dana is fresh in town from Atlanta. Her Manhattan contact and former college roommate is willful, manipulative Amy (Jade Catta-Pretta), who’s married to Peter’s bearded brother, David (Nicolas Wright). Peter, David and their half-sister, Chloe (Chloe Wepper), all work for their father, William (Kurt Fuller), who owns an engraving company and has branded his kids with the notion that whatever he wants from them he gets. Set up on a blind date with Peter, the usually level-headed Dana arrives flustered after a series of mishaps. They fail to hit it off after he’s too smug and she’s too hiccupy when crying. But amends later are made because otherwise this might as well be called Manhattan Try Again Next Week with Someone Else Story. It’s hard to see this one sticking around for very long. The dialogue and interior monologues occasionally have some snap. But Manhattan Love Story mostly is pretty thin soup in a city known for its delis. Seconds are not recommended.